is today! In the US and Canada but you know, nothing to stop us from extending it everywhere!! 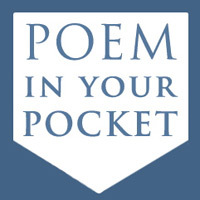 Initiated in 2002 in New York as part of its National Poetry Month celebration, Poem in your Pocket Day is designed to encourage people to select a poem, unknown or a favourite, and carry it around with them for the day, sharing it with others throughout. So, let’s get sharing; be it in your office, a bookstore, local park or simply on the sidewalk. If you’re on Twitter, use the hashtag #pocketpoem. For those more traditional folk, reach into your pocket and read out loud!